It’s alright if you do not believe, but I can tell you, this is the BEST homestyle almond tart I have ever tasted! Same compliment was given by my family, friends and even colleagues who tasted it as a treat from me! It’s simple with 2-stage bakings, but it takes less than 2 hours to get these fabulous tarts ready to serve! Thanks to my ‘baking Shifu’! 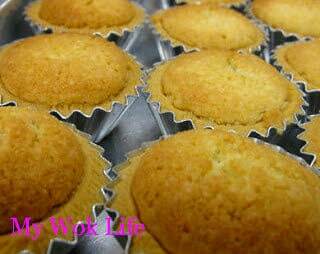 Small or medium tart moulds/ or disposable foil tart cups, greasing is NOT necessary. 1) Cut hard butter into small pieces for easy creaming. Cream butter and sugar (using electric mixer) in large mixing bowl at medium speed for 15 – 20 minutes, or until **fluffy. 2) Add in egg and beat at low speed till just well mixed. At same low speed, gradually add in 450 grams of plain flour (leave about 50 gram of plain flour aside to mix only when kneading on table top). Beat flour mixture (at any speed), till all combined and form a dough (it’s ok if the dough appears to be a little sticky). 3) Remove dough from mixing bowl and place it on slightly floured table top. Mix the remaining flour (by tablespoons) with the dough by kneading it a little, till all remaining flour finished. By now, the dough will not be sticking on your hand anymore. 4) Place a small lump of pastry dough into each tart mould, one by one, and press it against the tart mould evenly with your thumb to create a thin layer of pastry crust shell. Trim the excess along edges using small blade/ knife, to make it even and for beautiful presentation. 5) Preheat over to 180°C, and half bake the tart crust shells on middle rack for 15 minutes. 1) Cream butter and sugar at medium speed for 10 minutes, or until **creamy. Add in vanilla essence when creaming is almost done. 2) Add eggs, egg yolk, ground almond and flour, beat at medium speed till well combined. Almond mixture should appear thick creamy consistency, when done. 3) Roll a large triangle sheet of grease-proof baking paper into cone shape, and place ground almond mixture into this paper cone. Close its opening at the top, cut away the tip of the sharp edge and pipe almond filling into each half-baked pastry (tart crust). Bake them at 180°C, on medium rack, for about 20 minutes, or until golden brown. 4) When baked, leave it to cool before removing from tart mould. Alternatively, use disposable foil tart moulds (but remember to press the pastry very gently to avoid the foils turning out-of-shape). You may, therefore, serve the tarts together with the foil. 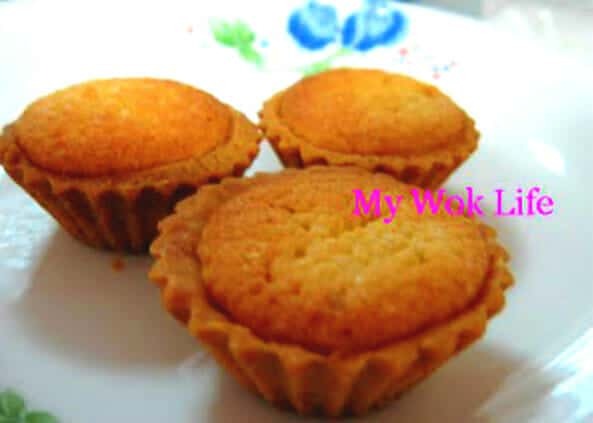 And also, no worries of making a large quantity of tarts as it may be kept for up to a week at room temperature, and up to 2 weeks if keep refrigerated. Otherwise, reduce the amount of recipe ingredients by half. 1 medium almond tart counts about 300kcal, while the bite-sized tart counts about 110kcal each. Tips: Do not need excessive kneading on the pastry dough. Just knead when mixing the remaining flour to form a smoother dough will do. * Choose normal ground almond, not the ‘fine’ ground almond, if you prefer the almond bites in your tarts. * For easy folding of paper cone, remember to cut the large baking sheet into a triangle piece first, before rolling it into cone shape. * If you find it difficult to make the paper cone for piping the filling, simply scoop a heaping spoon of almond filling into each half-baked tart crust gently, and do clean away any trace along the edges of the tart shell. The end result of your bake should come out the same. ** Fluffy texture – Butter and sugar should be beaten till light, smooth and soft creamy consistency (feel it with your fingers). The butter mixture should appear in whitish/ cream colour after beating for 15 – 20 minutes. It is normal that sugar may not dissolve, but still pretty in evidence in the mixture. ** Creamy texture – Less fluffy tecture. Beat for shorter time. Ground almonds? It looks delicious! I followed yuo from the foodieblogroll and I’d love to guide our readers to your site if you won’t mind.Just add your choice of foodista widget to this post and it’s all set to go, Thanks! Thanks for your suggestion. I’ll try doing it! 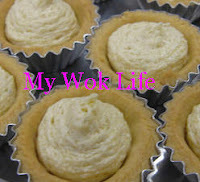 I baked these almond tarts last night and they are simply delectable!! 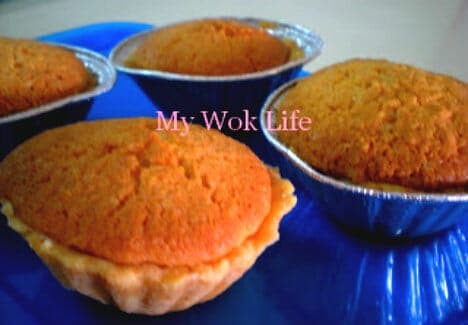 My husband loves them so much that he ate 3 at one go :) Thank you so much for sharing such a wondeful recipe. Please remember to cast me 1 of your vote at Blogger’s Choice Award for Best Food Blog, k?! See the top of the side bar of my blog for details. Thanks!! You know what, I baked another round of almond tarts last night cos’ we walloped up all in just 1 day (brought some to my colleagues aw well – all of them loved them). Drop a small teaspoon of jam into the pastry case before putting in the cake mixture. Wonderful!! Hello Patrica! I found this blog in Foodista and followed it here. Ok Almond? Tart? Intersting.. Where do you get your inspiration? By the way you can place more Foodista widget in your past and future blogs so that other Foodista readers can follow and see your blog too. Just search for a related recipe or food in Foodista and use its widget. I hope to read more from you. Cheers!